Jenni Marsh is a Features producer on CNN’s Global Projects team, covering the Asia Pacific region from Hong Kong. Her work has been published by CNN, the South China Morning Post, Al Jazeera, the Daily Mail, the Independent, and the Guardian. 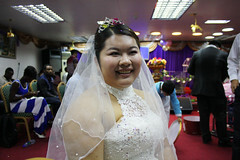 In 2015, she won a Society of Publishers in Asia award for Excellence in Feature writing for her report on Afro-Chinese marriages in Guangzhou. An alumna of the Wits University China Africa Reporting project, she continues to research China-Africa relations from a human interest perspective.